← We’re ready to go at OTC! Visit buy.nemaenclosures.com to order the electrical enclosure you need fast and easy. Plus, get free shipping to anywhere in the continental USA until June 30, 2013! We’re open for online business. You can buy standard electrical enclosures in the size that best meets your needs with a simple mouse click. Plus, it’s ready for you in five days or less! All standard electrical enclosures are competitively priced and UL listed to ensure satisfaction. Corrosion resistant Stainless Steel Type 304 wall mount enclosures are weather rated for outdoor use. Available in various sizes and includes a powder-coated carbon steel back panel. Superior corrosion resistant Stainless Steel Type 316 wall mount enclosures are rated for extreme weather conditions and are ideally suited for marine applications, salt water applications and/or offshore applications. Available in various sizes and includes a powder-coated carbon steel back panel. Affordable and versatile 5052 aluminum wall mount enclosures are used in a variety of industrial applications. Available in various sizes and includes a powder-coated carbon steel back panel. Need a standard enclosure customized in a hurry? Holes, cut outs, gland plates or welded couplings can be added in two additional business days or less. 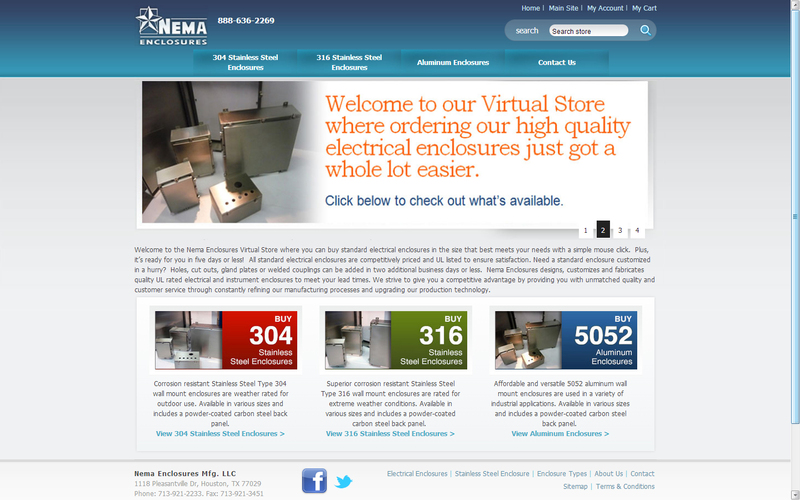 Ordering an electrical enclosure from Nema Enclosures in the size you need is simple and easy. Visit our virtual store often as we continue to list new products and sizes. Click on the link below to find out more or to begin ordering right away.